Inspired by a convergence of traditional and modular electronic instrument capabilities, ZTEC Instruments is pleased to offer the new award winning ZT4610 series of digital storage oscilloscopes. With a price and feature set comparable to industry standard oscilloscope products, the ZT4610 series provides the first fully featured modular oscilloscope on the market. 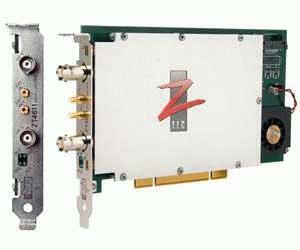 Available in PCI, CompactPCI/PXI, VXI, & LXI, the ZT4610 series provides an intuitive and high speed software interface to satisfy even the most demanding automated test applications. And unlike other modular digitizers, the ZT4610 series combines all these features with traditional instrument ease of use for intuitive stand-alone user interaction.